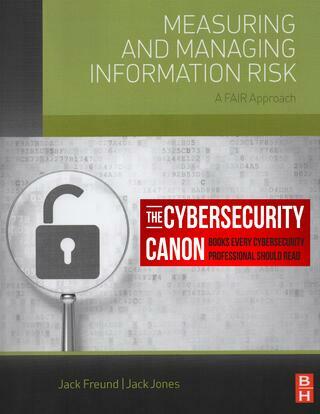 The FAIR Institute is proud to announce that Measuring and Managing Information Risk: A Fair Approach, co-authored by Jack Jones and Jack Freund, was inducted into the 2016 Cybersecurity Canon, which recognizes authors and works of literature that accurately depict the history, milestones, and culture of the modern cybersecurity industry. The goal of the Cybersecurity Canon is to identify a list of must-read books for all cybersecurity practitioners. Books are nominated and voted upon by cyber security professionals for induction. You can read the full press release here. You can start learning about measuring and managing information risk, by ordering a copy of the FAIR book here. The FAIR Institute, the expert, non-profit organization where cybersecurity professionals meet to learn how to manage cyber risk from the business perspective, is offering FREE copies of the book for certain levels of membership. See if you qualify here.